Today Lopez was my guide – Lopez is the brother of Pastor Thomas Francis who showed us around Dubai. He kindly drove me around the city showing me the sights and helping me get my bearings. Chennai is a great, bustling city. We went to the famous Marina beach and the historic Fort area. A lot of what we saw was to do with the Apostle Thomas. 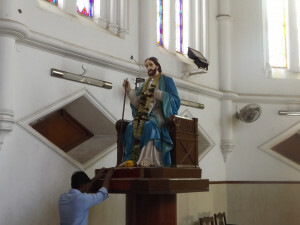 Tradition has it that the disciple who only believed when he saw the pierced feet and hands of Jesus went to India in 52AD (first to Kerala and then he ended up in Madras [Chennai]). 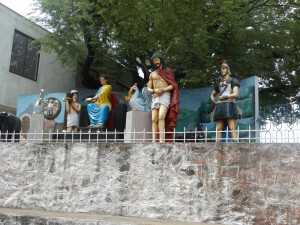 He was then martyred in 72AD on what is now called Saint Thomas Mount. We went to see the church of St Thomas which, it is believed, is built over the tomb of the Apostle; and then latter we went to St Thomas Mount. But I’m not here to pass judgement on the faith of people I do not know. Most of all today has taught me to cherish the book of Hebrews. I am so grateful that Christians no longer need a High Priest because Jesus has already fulfilled that role. We can pray directly to the Lord of all creation. What a fantastic thought.